One of our previous articles described the operating principles of the DPAPI system, its exceptional reliability, functional value, and cracking resistance. Not long ago, our support team received a message from Michael Clark, who had discovered that some DPAPI blobs were having decryption issues. After determining the cause of the problem (thanks to Michael, who has provided us with exhaustive information necessary for the analysis), we have revealed a rather interesting breach in the security system of DPAPI which seems common to all server operating systems, beginning with Win2K and ending with Windows Server 2012. Briefly, the essence of it is the following: By default, the Master Keys of all domain users with interactive logon privileges, except for built-in accounts, are created in the Windows 2000 compatibility mode; therefore, the decryption of the data encrypted with DPAPI doesn't require the owner's logon password. Passwords and form auto-completion data in the popular browsers: Internet Explorer,Google Chrome, Opera Browser, etc. E-mail account passwords in Outlook,Windows Mail,Windows Live Mail, etc. Personal data in any application, programmatically protected with the Windows API function CryptProtectData, such as Skype,Windows Rights Management Services,Windows Media, MSN messenger, Google Talk, etc. Amusingly, the same hashing function is also used in validating users' logon passwords, the hashes of which are stored either in the SAM registry or in the Active Directory (for server operating systems). Thus, the user's plaintext password is not really necessary do decrypt the Master Key. It is sufficient to just take an existing MD4 hash of the respective user from SAM or NTDS.DIT and use it as data-in. The rest is already known. 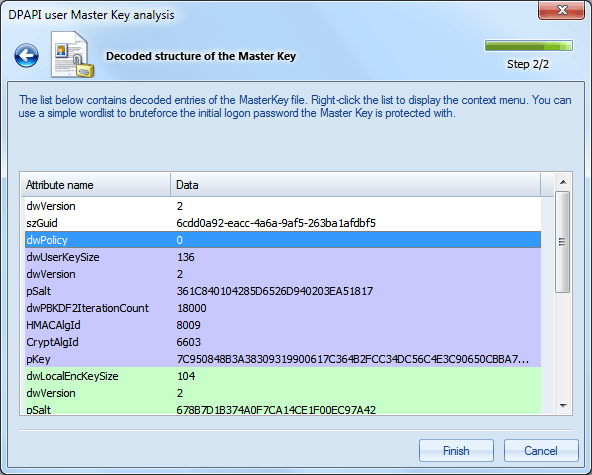 Which algorithm is used – SHA-1 or MD4 – is specified in the header of the Master Key. Bit 4 of the dwPolicy flag indicates that the Master Key uses the SHA-1 algorithm. Newly created users with interactive logon privileges in Windows server OSes do not have this flag set by default. Respectively, the decryption of their private data doesn't require the logon password. Let's move on from theory to practice and try adding a new user to a Windows Server 2012 domain, then create some DPAPI secret and then decrypting it offline without the owner's logon password. Open the “Active Directory Users and Computers” console and create a new domain user named Test. Grant that user an interactive logon privilege. To do so, you can simply add that user to the local administrators group. Now we need to log off the system and then logon under this account. The new account doesn't have the Master Key yet. It will be created during the first call of the CryptProtectData function.We'll speed that process up by forcing the call for the respective function. For that purpose, we have a homonymous utility CryptProtectData.exe, which simply calls the API function CryptProtectData with command-line parameters (the utility source code is available on the website). Launch it with the following parameters: CryptProtectData mysupersecret out.dat. At the output,we'll have the out.dat file with a DPAPI blob containing our encrypted text (mysupersecret). Where <SID> – the owner's sid.We'll still need it, so either memorize it or copy the entire catalog. Other than that, for the offline decryption of the out.dat file we'll need the MD4 hash of the data owner, which is stored in the Active Directory. To get it, we'll take advantage of our utility and make a copy of the NTDS.DIT file, as well as a copy the SYSTEM registry required for obtaining the hash. The owner's hash (files NTDS.DIT and SYSTEM). 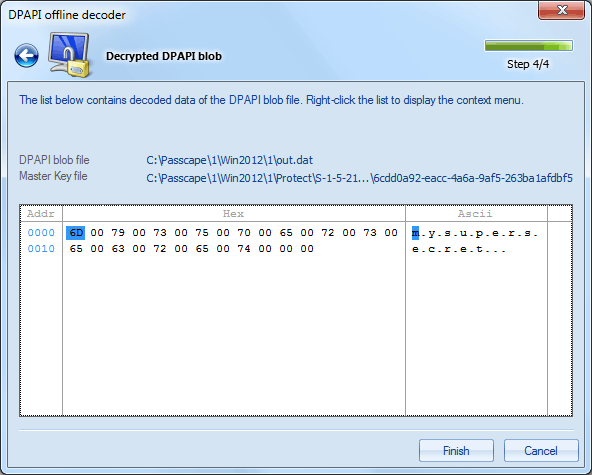 Now, launch the DPAPI offline decryption utility and tell it the path to the out.dat file. 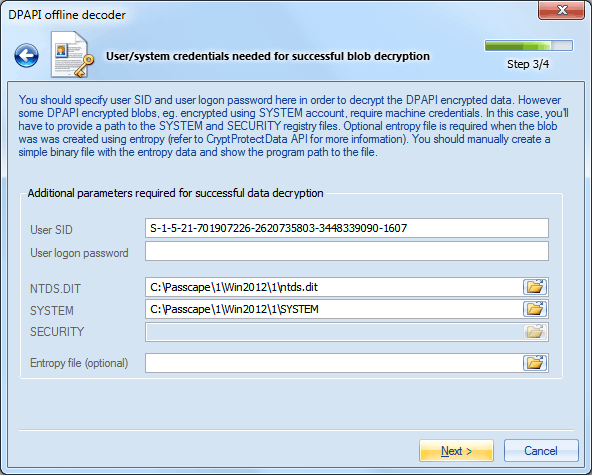 On the second step of the Wizard, specify the path to the data owner's Master Key: select the path and then click Next. The program pops a warning that a vulnerability is found in the Master Key, and therefore the decryption can be carried out two ways: with the user's password and without it.We, certainly, want the latter. So, on the next step of the Wizard, enter the owner's SID and the path to the NTDS.DIT and SYSTEM files, leaving the password field blank. Click Next, and here we have the decrypted secret. As you can see, the owner's password wasn't necessary. What remains quite unclear is whether this flaw in the interactive users is related to an error or it shouldn't be treated as such. Perhaps this is a peculiarity of the DPAPI implementation in the server operating systems; for instance, to provide backward compatibility. On the other hand, this seems to be highly unlikely, as the safety of user's confidential data is not properly ensured, while DPAPI was specifically meant to be the data protection system based on the owner's password. Funny, but it turns out that desktop PCs are more resistant to offline password recovery than those running the server operating systems. One way or the other, system administrators should be aware of this vulnerability, as forewarned is forearmed. 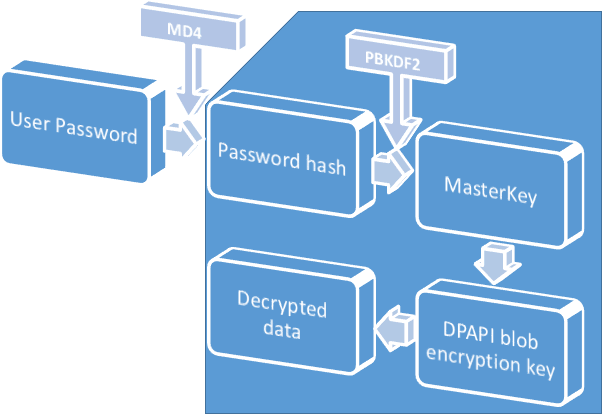 Maybe you can prevent Windows from storing a LAN manager hash of your password in Active Directory and local SAM databases and thus for DPAPI to use SHA-1? Well, actually it's not difficult to add the feature. But it may be dangerous because an inexperienced user can turn off backward compatibility and ruine a server, for example. I think, it is better to left it up to Admin. What about DPAPI and SHA-1. It appears that things are even worse than described in the article. It it funny but new version of our software can decrypt any DPAPI blob of any domain user without knowing the owner logon password. 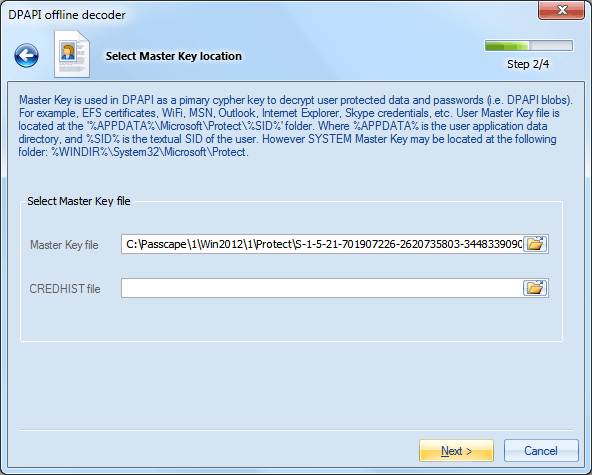 The decryption key (for all users) are stored in Active Directory. So anyone who has access to AD (in a domain) can decode and view DPAPI secrets of other users. 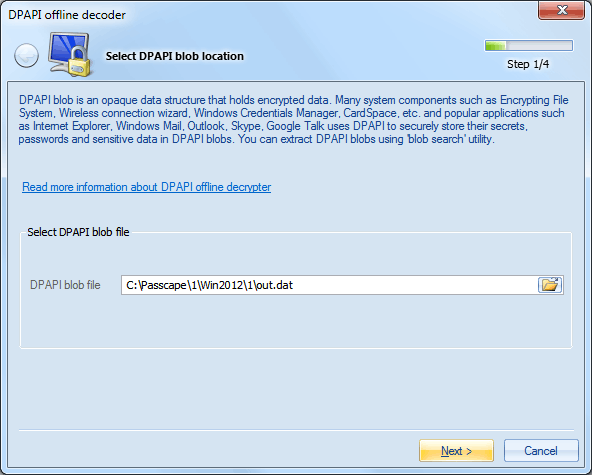 Just wanted to know, on how do we conclude the default algorithms being used by DPAPI in Windows 7 or other operating system, I was referring to your artocle "DPAPI secrets" and it says by default DPAPI uses AES 256 CBC mode can u guide me how to get this as an evidence in Windows Operating system. Default algorithm usage is hard-coded in system to prevent it from been compromised by setting an 'unsecure' encryption type or parameter. For example, iteration count used in key derivation in Windows 7 is 5600. If you occasionally set 1000, the system will use the default value. However setting it to 6000 will be ok.